When I decided to start a Warhammer club at school, I planned to make a new army to use to inspire the kids, and of course, to crush them remorselessly until they learn how to do better. 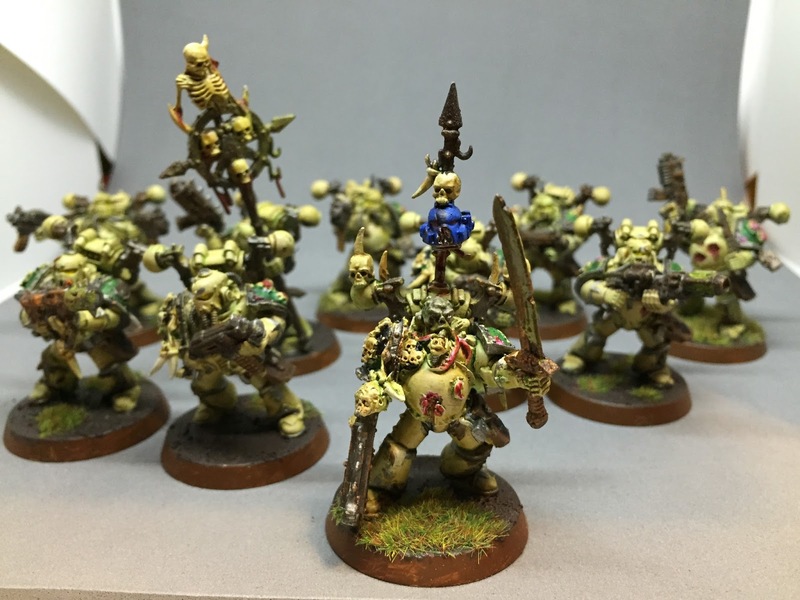 It took me a little longer then anticipated to get the minis painted and together, but here we are, 750 points of Death Guard. Well. Children tend to play space marines. So I wanted to do some bad guys. I wanted a low model count army so I could actually try and get to a meaningful conclusion in the hour available. I couldn't use my existing chaos army, because frankly, I didn't want to have to explain Slaanesh to anyone at work. 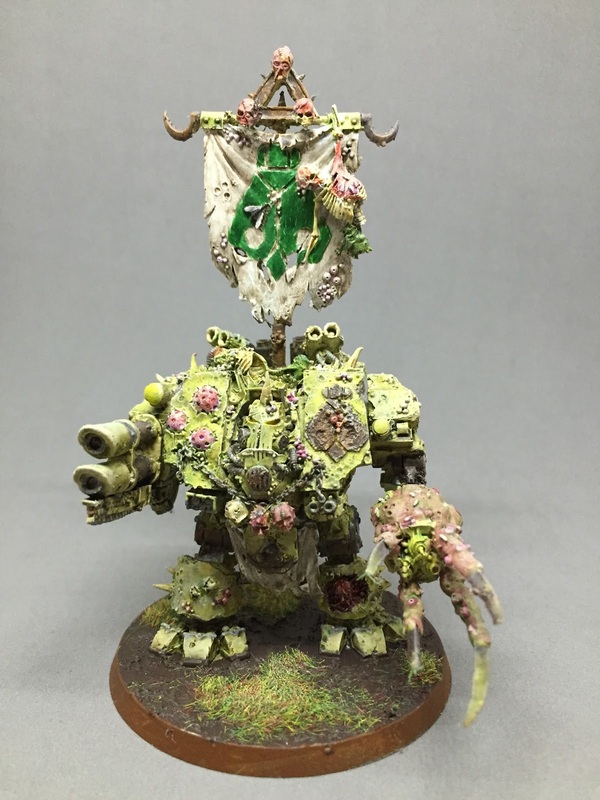 Also, painting the death guard having a bad day on the base of my latest Knight Titan (pictured in the previous post) really got me excited about everything grubby. My style of painting 'not being very good but trying to make up for it with gimmicky techniques' works really well on things that are supposed to look a bit dark and grubby. Which is why I have never really collected Eldar or Tau. First up is Typhus. 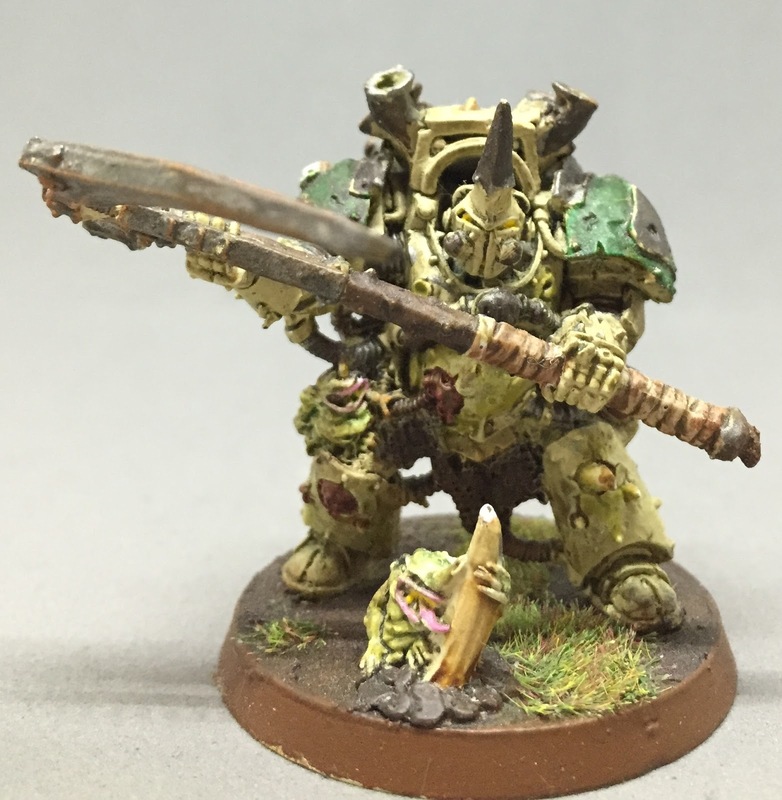 Not much to say about him, except he is a rescued metal Typhus sourced from Ebay, because honestly. Finecast. I did think briefly about using the Forge World Typhon as a stand in, but I went with the original. I think this classic sculpt is still excellent in today's range. Squad of Plague Marines. These are the GW Plastic Chaos Space marine kit with the Forge World Death Guard upgrade pack, a few extra knives and holsters from the bitz box so every model is strictly WYSIWYG. Also, there is a Forge World 30k melta in there, because you only get one melta in the Chaos Marine plastic box, and I had this knocking around. 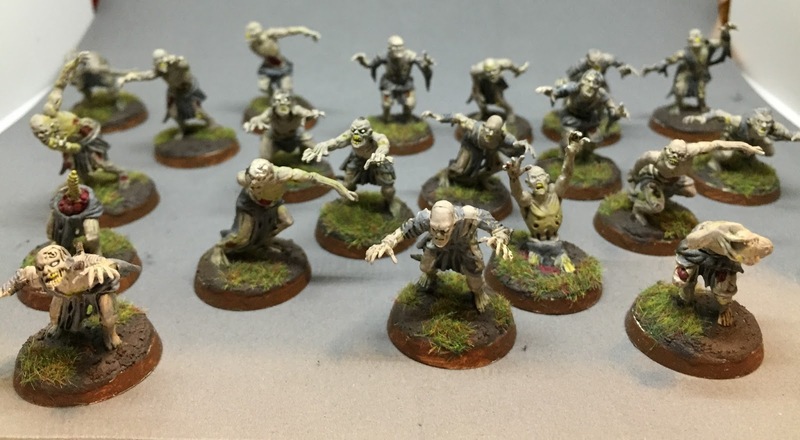 Plague Zombies. These are from Mantic, and are in fact a mix of zombie and ghoul bits. They sell a set with four sprues of each for £15, which is not bad, compared to the GW Zombies which are, frankly, showing their age. I did have to base them onto GW bases. They have (small) integral bases as well, but I don't think you can tell. Dreadnought - Forge World. A lovely kit, though he came out a little greener then intended. I think I got a little carried away with my various washes and glazes. There you have it, the trick now will be in not expanding it into a massive shelf bending army. Which... has happened to side projects of mine before. "Frankly, I didn't want to have to explain Slaanesh to anyone at work."